Follifoot’s derby clash with Airedale & Wharfedale Division One rivals Bilton CC was brought to a premature end by the rain on Saturday. The game was interestingly poised when the heavens opened, hosts Bilton 63/3 chasing 197 for victory. Earlier, James Orton (31), Ben Whitehead (30 not out) and Yasar Ali (29) had all made useful contributions as the visitors reached 196/7 from their 50 overs. Amir Hussain, Mustahsan Ali-Shah and Tuseif Arshad all took a brace of wickets apiece for the home team. Bilton then lost early wickets in reply, Patrick Nagel snapping up 2-32, but the wet weather meant that the sides were forced off after 18.2 overs and no further play was possible. Relegation-threatened Beckwithshaw’s fixture was also brought to a premature conclusion by the rain, but Ross Sedgley’s men were in some trouble on the road at high-flying Rawdon. The hosts had declared on 229/5 after 38 overs and although Sam Moore hit 36 when ‘Shaw responded, they were five wickets down and still 101 runs shy of where they needed to be when the contest was abandoned. The men from Killinghall Road ended the game with six points to their name, but now find themselves 17 adrfit of safety. 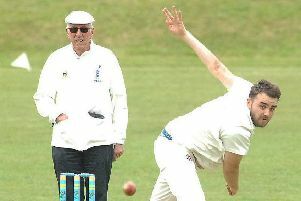 In Division Two, Collingham & Linton took advantage of the abandonment of the top-of-the-table meeting between Horsforth Hall Park and Tong Park Esholt to move into pole position. A return of 3-38 from the ever-reliable Toby Jacklin helped get rid of Olicanian for 166. 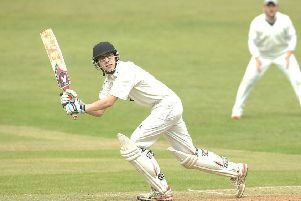 Jonny Haslem’s unbeaten 56 then steered in-form Collingham to a rapid six-wicket success in just 22 overs. Bardsey’s third division match at Skipton was abandoned with Harwood Williams’ troops 7/2 chasing 187.